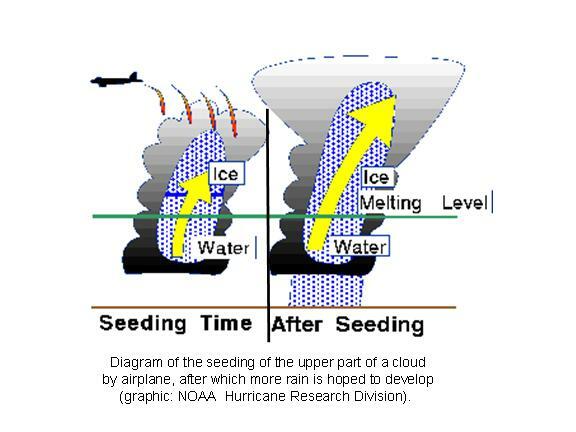 Cloud seeding is the process of spreading either dry ice, or more commonly, silver iodide aerosols, into the upper part of clouds to try to stimulate the precipitation process and form rain. Since most rainfall starts through the growth of ice crystals from super-cooled cloud droplets (droplets colder than the freezing point, 32 deg. F or 0 deg. C) in the upper parts of clouds, the silver iodide particles are meant to encourage the growth of new ice particles. The history of cloud seeding has experienced uncertain results because it can never be known whether a cloud that rains after seeding might have rained anyway. This is because seeding is performed on clouds that look like they have some potential for producing rain. REDUCING THE INTENSITY OF HURRICANES THROUGH SEEDING? NOPE.In the early 1960's, the National Hurricane Center began a series of experiments in seeding of hurricanes to reduce their intensity. Since the most destructive hurricane winds are produced from hurricanes with the smallest diameter eyes, STORMFURY seeding flights tried to stimulate the growth of a new eyewall of convection outside the inner, more destructive eyewall. Unfortunately, the project failed. It has since been determined that there are already an abundance of ice crystals in hurricane rain systems, so the production of new ice particles through cloud seeding probably has little if any effect.